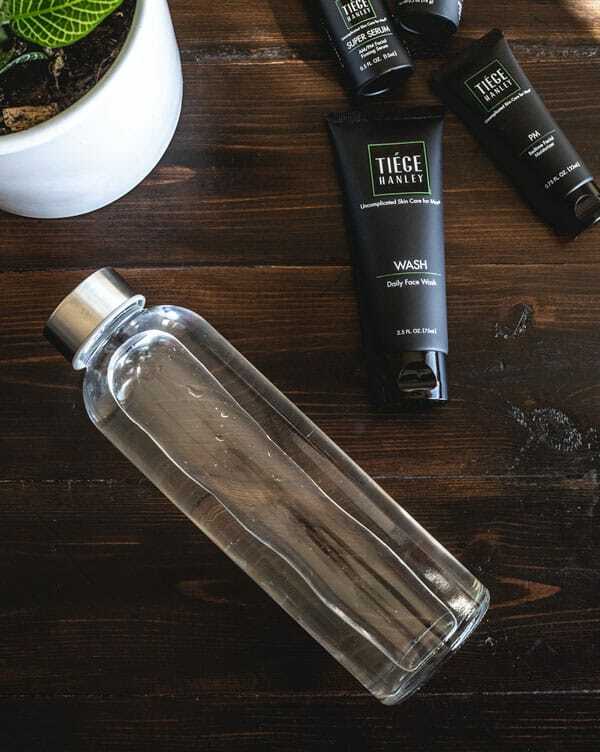 Tiege Hanley offers high-end skincare products for men at Target-level prices. Thanks to Tiege Hanley for partnering with us on this post and offering Primer readers an exclusive discount. Skincare is a $120+ billion-a-year juggernaut telling you what’s wrong with your skin – and selling you on a solution. 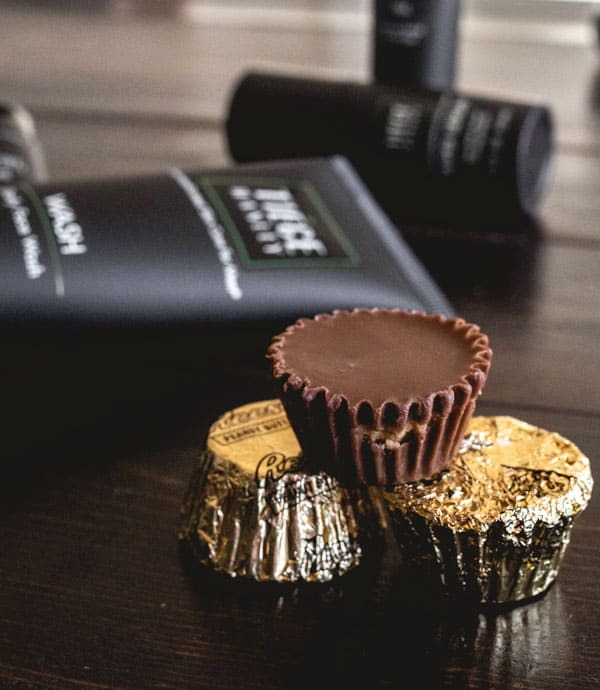 Have you ever noticed how the whole industry is built on telling you do stuff… which usually involves adding some exotic new product to your skincare routine? Here’s a radical proposal: the best thing for your skin is to stop doing a handful of bad habits most of us aren’t even aware of. The traditional skincare industry thrives on adding complexity to skincare because complexity leads to confusion. Who has time to learn the precisely correct combination of essential oils and antioxidants for your complexion? 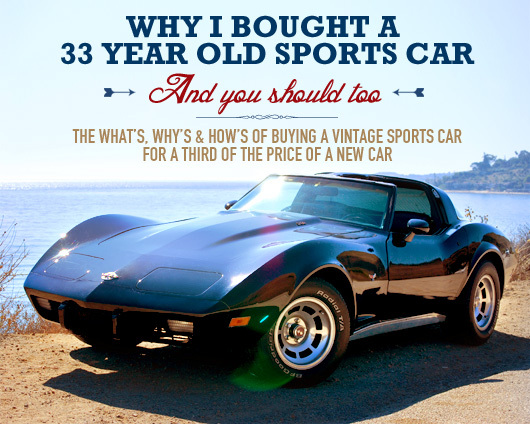 It’s easier to just purchase the next big thing. Well, it’s time to simplify. Skincare can be simpler. In fact, it is simpler. 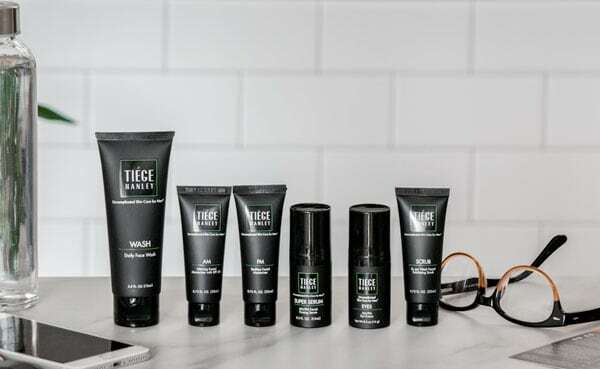 We’re excited to partner with Tiege Hanley because, as you’ll discover, they’ve built a skincare system on clarity and simplicity. They understand that breaking bad habits is easier when you’re subtracting things, not adding new, complicated routines. That’s why we’ve talked with Tiege’s experts to offer this straightforward checklist of the six key things not to do that will save your skin a ton of hurt. With a whole industry telling you a thousand things to do – here’s a handful of don’ts that will take you much further. Depending on who you ask, Americans check their phones anywhere from 47 to 300 times a day. And with each check, we transfer bacteria from our hands to our phones. 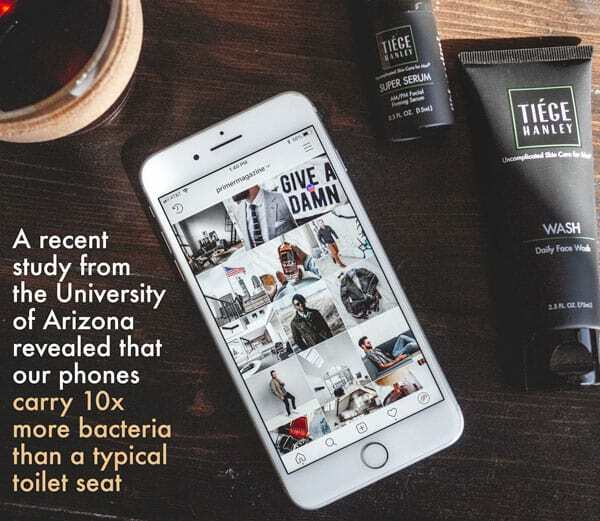 As a result, a recent study from the University of Arizona revealed that our phones carry ten times more bacteria than a typical toilet seat. And unless you’re already taking measures, your phone is probably no better. So why is that bad for your skin? You’ve probably heard of your body’s “microbiome,” right? It’s the ecosystem of living stuff – a lot of it bacteria – that naturally inhabits your body, both inside and out. Your skin, and especially your face, has its own microbiome of helpful or benign bacteria already. The problems start when you introduce foreign and pathogenic micro-organisms that don’t belong to your face’s Garden of Eden. Everything from E. coli to MRSA to the flu virus has been found on smartphones, and all these compete with – and disrupt – your face’s regular mix of microscopic critters. The solution: take steps for a more hygienic phone. For starters, stop taking it into the bathroom. Next, wipe it daily with a microfiber cloth – this will pick up a significant number of bacteria. Once a month, wipe your device with a combination of water (60%) and rubbing alcohol (40%). Finally, you can stop mashing your phone to your face altogether with a headset or earbuds. Of course, your phone isn’t the only thing you should be cleaning every day – check out our rundown of everyday essentials you should be keeping (somewhat) clean. You’re probably tired of hearing it. You should sleep more in order to… prolong your life, boost your brain, appear younger, increase testosterone, and generally win at life. The thing is, it’s good advice because it’s true. And it applies to your skin, too. Sleep deprivation equals stress, plain and simple. Stress increases production of the stress hormone cortisol in the body – cortisol helps your body cope with stressful situations and be ready to fight or fly. The problem is, when your body is stressed it stops building and repairing. “There’s no energy!” it shouts in a classic Arnold Schwarzenegger voice. All those resources it would normally use to repair different parts of your body are routed to simply surviving. As a result, collagen production that would normally renew your skin – and especially your face – is halted. Even more disturbing are studies that suggest sleep deprivation interferes with your skin’s function as a barrier for disease. One lab found that prolonged sleep loss in rats caused their skin to develop lesions. Lesions are gross. Don’t get lesions. The solution is simple: figure out how much sleep you’re actually getting (hint: a full sleep cycle, including REM, is about 90 minutes), and use a sleep calculator if need be. Then ensure you’re clocking at least the recommended 7.5 hours a night. As in, stop smoking. If you’re like, “who smokes?” guess what: 37.8 million people in the U.S. alone. And at least 20% of those fall between the ages of 25 and 40. If you don’t smoke, chances are you know at least a handful of people who do. The science of what smoking does to your skin reads like the curriculum of a D.A.R.E. class in 6th grade: nicotine reduces blood flow to your skin, which means it doesn’t get enough oxygen and nutrients. And the chemicals in tobacco damage the collagen and elastin proteins that give your skin structure. The good news is, vaping is okay! Just kidding. According to the total nerds at Yale University, vape still contains harmful levels of nicotine. Besides all the chemical dangers, there’s another, less obvious way smoking wrecks your skin: puckering your lips to hold a cigarette or squinting your eyes to keep out smoke will deepen facial lines. So unless you want to look, live, and die like the Marlboro man, we suggest you grab some gum or a patch and give your skin a break. Your skin might be your body’s largest organ, but when it comes to getting its fair share of water, your skin is basically last in line. You know what that sounds like? The desiccated suntanned skin of Florida retirees. Not a good look. The question is, how much water is enough? While the number varies depending on your source, most experts say between 7-8 glasses a day. More if you’re hitting the gym. If a glass is 8 ounces, that’s 64 ounces per day – or half a gallon of water. A typical bottle of water has 16.9 ounces, meaning you need to be drinking 3.7 bottles of water per day. Start swigging. You can do even more to help your skin retain moisture – more on that below! Here at Primer Magazine we already don’t like diets with too much sugar. Just check out our guide to cutting killer sugar (without even noticing it). Here’s another reason to watch your sugar intake: studies have shown sugar speeds up the aging process. As a result, excess dietary sugar may contribute to premature aging of your skin. The damage is compounded by exposure to UV light, so unless you’re wearing sunscreen on the regular, that donut is doing double harm to your visage. Cutting added sugar and sugar-heavy carbs is a first step. Adding more fresh fruits and veggies to your diet may help prevent damage by giving your skin the antioxidants it needs to fight the aging process. There’s one aspect of your daily routine that nearly every study, source, and expert agrees is bad: using bar soap to clean your face. Study after study has shown that soap dehydrates your skin, stripping away the oils and helpful bacteria that keep it healthy and retain moisture. The reason? Soap is meant to break up and whisk away lipids – fats – that form a natural barrier to moisture leaving your facial tissue. Bar soap has been used for generations to strip grease, oil, and other tough stuff from the hands of hard working men and women the world over. To say it's overkill to use that to wash your face is a massive understatement. Ever felt your skin was tight and dry after washing your face? That’s exactly what you want to avoid. The solution is to wash your face with a gentle cleanser formulated specifically for that purpose. Tiege Hanley’s Daily Face Wash is designed to clean your face while leaving your natural oils more or less intact to protect from drying out. Another key step to take is applying a moisturizer. The University of Wisconsin recommends doing it within two minutes of getting out of the shower, as the heat and moisture have caused your skin to become more porous and better able to absorb a moisturizer. Whether you prefer a shower in the morning or evening, Tiege’s Morning and Bedtime Facial Moisturizers have you covered. The Morning Facial Moisturizer also includes a low SPF sunscreen to protect your skin from damaging UV radiation (though that doesn’t mean you should slam three bowls of Frosted Flakes or another sugary cereal). Primer readers save 20% on their first order! As you’ve discovered, good skincare is about not doing certain things … but what about the things you should do? That’s where Tiege Hanley can help. The Tiege Hanley system was designed from the ground up to be dead simple. A single base package includes everything you need and nothing you don’t. In addition to the Daily Face Wash and AM/PM moisturizers, you can expect an Exfoliating Scrub. You can level up your skincare by adding an AM/PM Eye Cream and AM/PM Firming Serum. Suffer from acne? Tiege has an answer for that, too. The Acne Cream is formulated to help reduce redness, bumps, and breakouts without devastating your skin in other ways. This might sound like a lot of different products, but they couldn’t be simpler to use. Each month’s supply comes with a card that tells you when to use each product and includes a diagram of how much is the right amount (hint: it's less than you probably think). 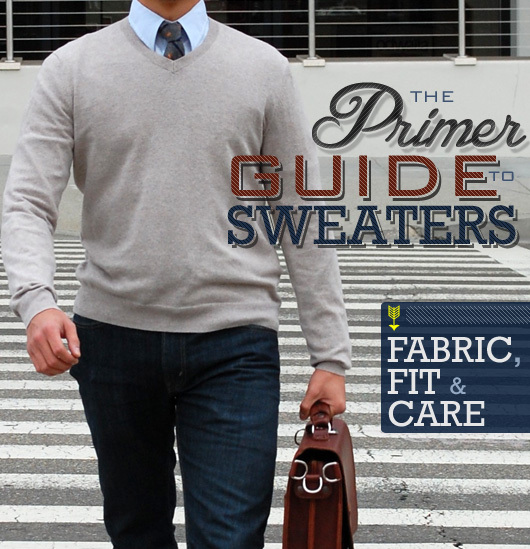 Click here to get the Primer exclusive 20% discount off of your first order. Doctors have to swear to do no harm to their patients. Often, that means not doing something … even if the patient desperately wants them to. Taking care of your skin isn’t so different – stop doing the six items on this list and it’ll prolong your skin’s health and appearance for a long time to come. What should you stop doing to your skin? Let us know in the comments below! Have to Stop taking hot showers in the morning and not applying moisturizer. Winter in Canada makes for a dry face with the wind and not moisturizing only ramps up the drying process. I’ll promise to treat my skin better if you try your best not to call University researchers “total nerds.” It’s not really all that funny, sorry. Hey Bill, the joke is on the way stereotypical macho guys view science and scientists: if you’ve read much of Primer you’ll see that we’re very pro science, research, and academia. I’ve had an itch in my nose and around for years. I’ve had a lot of tests and used drugs. But it didn’t. what can you suggest?